According to studies, a majority of Filipinos do not have bank accounts or savings. The reason behind this is that most Filipinos lack financial literacy. Another reason is that most of us think that we do not earn enough money to set aside for our future, which is completely wrong according to SUZE ORMAN, an expert in personal finance. Before I got to watch Suze Orman on ANC, my outlook on money is similar to what many people perceive – that money certainly makes the world go round. My stance has grew even more when I attended a FOREX seminar/training wherein the speakers often stressed how having plenty of money can change your life and how money can give you everything you’ve always wanted in life. This, I know, is most individuals dream. But is this what we should be eyeing at – purely material things? If you are already beginning to question how you should look at money, then you might want to continue reading on. 1. Live BELOW your means while meeting your needs. This is contrary to what most us believe, which is to live WITHIN our means. These two statements are entirely different and can bring diverse impacts on our lives. This means that you should not spend everything you earn to the very last centavo. This way, you can set aside some money and label it as savings. For younger people or those in their 20’s, Suze Orman has advised that you can start saving at minimal amounts per month. 2. Find pleasure in SAVING rather than in SPENDING. “ONE DAY MILLLIONAIRE.” Are you familiar with this? I bet you are. This is how a lot of people spend after receiving their salary. Just after a few days, they’re back to being penniless. How are we going to resolve this? Well, each of us should already begin to realize that it is much happier to see our savings getting bigger and bigger every month than buying everything you’re aspiring to have and see your money fade that instantly. 3. Money is supposed to be for your SAFETY and SECURITY. Suze Orman stressed during the show that money is not meant to buy things but to provide safety and security. If the things you acquire would not be able to keep you safe and secured, then you better think twice before buying it. 4. NEEDS versus WANTS. If you want to save for your future, learn the difference between needs and wants. Needs refer to your necessities, such as house, clothing and food. Anything other than these things which are in excess of what you actually needed are considered wants. For instance, if you go to a mall and you see a little black dress that instantly caught your eyes, would you take it? Before even buying anything, make it a habit to ask yourself this question, “Do I need this or do I want this?” By weighing things properly, I’m pretty sure that you will soon find yourself always in a happy state because you already have money in your bank account – enough money that can continuously make you feel safe and secured. 5. Only buy stuff that you can AFFORD. Let’s admit it. When new models of phones come out in the market, most of us would want to have them by hook or by crook, even if it means using our credit cards or getting a loan from banks or cooperatives. This is the kind of attitude that has to be totally changed. I reiterate that in order for you to have savings, you have to decide if it’s either a need or a want. But if you think you really need it, make sure you can afford it in cash and with your own money. 6. PAY-OFF all your credit card debts and then move on. If you have existing credit card debts, settle them first. This is the first step on how you could start saving. After you’ve settled all your debts, stop borrowing and start living below your means. You might think that you are depriving yourself of good living when you live below your means but you’re not. You’re actually doing yourself a good favour. Why? It’s because you are building yourself a bright future. Right? 7. Live a SIMPLE life. 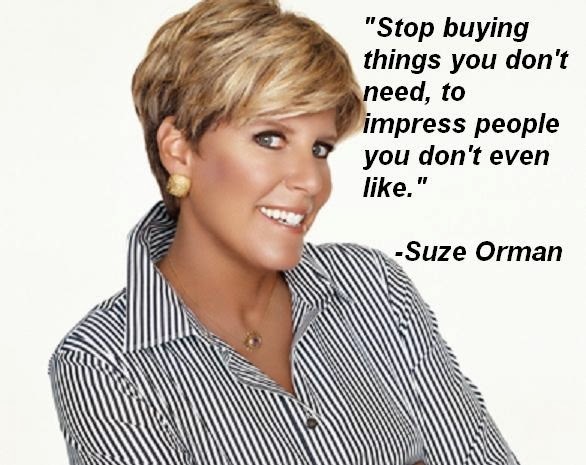 This is probably the most import thing I’ve learned from Suze Orman. If you have lots of money, do not think of buying a huge house right away. Buy a house that would simply fit your family. If you have a car that still works fine, then there’s no need to buy another one. Such a simple insight yet very practical. This was post was intended for the now defunct Classy Filipino Magazine HongKong by Brendaleen C. Balen. Thanks Ms. Brendz for letting me publish it here.